KUALA Lumpur is dotted with plenty of hidden gems when it comes to good food. And in one of those rare occassions, I was led to one makan place in Lorong Brunei by Uncle Bil Choy, a seasoned folding-bicycle cyclist. Choy said he frequents a roadside stall in the Pudu area which is famous for two things: Suay Kow (dumplings) and Curry Laksa. 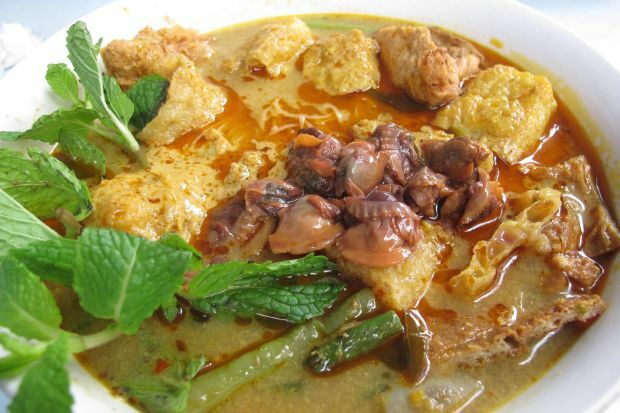 Curry Laksa specialist: Stall 168 is famous among foodies, bloggers and families. “Eh, Sam ah! 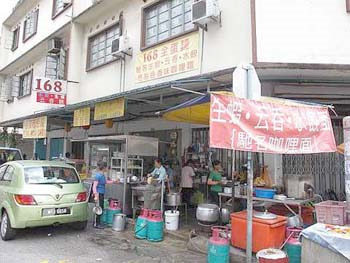 We much check out this stall la, their Suay Kow is the cheapest in town,” said Choy. Sporting a classy Brompton P6R folding bike, the veteran cyclist led me, Michelle, my wife and three other friends — Wey, Ming and Jackie to the stall after a morning cycling session at the Sports Toto National Charity ride which was held in Berjaya Times Square recently. We rode our bicycles through the backlanes of Jalan Imbi and Jalan Walter Grenier to Lorong Brunei. My recollection of this place was pretty glum because in the past, this area was literally infested with pek hoon kias (junkies). But much has changed as the Pudu area has been given a clean-up by the cops. It is now a safer place and you can actually see families having their meals around there. Choy led us to a shop called Yat Luk Fatt (168) which is located at a corner lot. We parked our bicycles and found a table for our group and a Chinese-speaking Indonesian waitress took our orders. I settled for a large bowl of Curry Laksa while Jackie Tan, our cyclist friend who won the grand prize at Sports Toto’s lucky draw placed her order for a bowl of laksa blasted with chee phei (pork rind). A bowl of laksa costs RM4.50 and the best deal here is that you can add some taufoo pok (beancurd), chee phei, and see hum (blood cockles) to your order. When my bowl of laksa came, everyone had a shocked expression on their face as the serving was huge. With a good appetite after cycling some 23km around Kuala Lumpur’s city centre, I worked on my bowl of noodles like a starved crocodile. Finishing the meal was effortless and when it comes to taste and value for money, I would give Yat Luk Fatt’s noodles 7 out of 10 on the Samoscale. Yat Luk Fatt is located off Jalan Brunei Utara in Kuala Lumpur and for you gearheads out there the GPS coordinates are N 03 08 322, E 101 42 762.